PA police, in a rare show of force, raid the home of Mohammed Dahlan, arch-enemy of Abbas and who faces charges of murder and corruption. Palestinian Authority, in a rare show of force Thursday morning, raided the Ramallah home of Mohammed Dahlan, arch-enemy of PA Chairman Mahmoud Abbas and who faces charges of murder and corruption. Armed police locked Dahlan in a room and confiscated computers, 16 weapons and 12 of his and his bodyguards' vehices, including two bullet-proof cars. Dahlan was the ruling kingpin in Gaza until Hamas overthrew the Fatah faction in a terrorist militia war four years ago. The ability of the police and Palestinian Authority soldiers to overcome Dahlan proved their capability in capturing terrorists, something they generally have not done except to single out rival Hamas terrorists from Hamas - and now Dahlan, rival to Abbas. 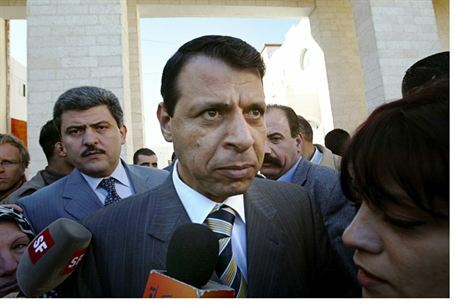 Dahlan built a personal political and financial empire that threatened the power of Abbas. Abbas’ Fatah party last month expelled Dahlan, and a PA court has rejected his appeal to remain in the movement, leaving the final expulsion order up to the Fatah Revolutionary Council, where a two-thirds majority is needed to approve his ouster. He had been living in Damascus and took the chance of coming back to PA-controlled areas one week ago. He has been charged with using government coffers and with bribery and murder to boost his own personal army and fortunes. His trial began behind closed doors this week. He is one of Israel's most implacable enemies.